Ensure you have all the pub equipment you need with our comprehensive range of cellar equipment. In our Cellar Equipment category you'll find everything you need to run and organise your cellar effectively and efficiently at your licensed premises. We stock everything from cask taps to beer filter papers, with plenty more on offer besides. This range of pub cellar equipment also includes everything you need to keep your cellar clean and tidy. Including pub essential products such as dipsticks, mallets and keg taps to help you keep your cellar running smoothly and pints free flowing. No matter whether you run a bar in the city centre or a gastropub in the countryside our cellar equipment will help you keep your customers happy and maximise your profits. 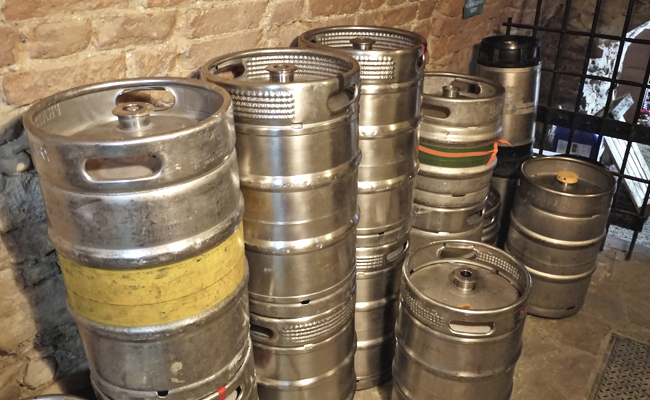 If you are running a busy pub or bar the cellar is pretty essential so make sure you have the right equipment at hand to keep your ales, lagers and ciders flowing nicely! At Pattersons Bar Supplies we stock all the essential bar equipment, pub accessories and bar products you need to run every aspect of your pub as smoothly as possible. Don't forget we are on hand to offer any advise or answer any question about cellar equipment, wholesale bar products or bulk buying your pub supplies. Thor Black Rubber Mallet 3"
Soft Spile for Cask Ale 1 1/8"